Sometimes, what a game lacks in certain areas can be made up for in charm, and Caveman Warriors knocks it out of the park in that regard. The story is zany but simple; aliens invade Earth during prehistoric times and abduct some cave children and it’s up to our four intrepid heroes to rescue them. This is accomplished by traversing distinct and vibrantly colored levels that will heavily challenge your platforming skills while maintaining the fun and interesting gameplay. No platformer is worth its salt without fun and likable characters and Jack, Moe, Liliana, and Brienne fill these roles wonderfully. 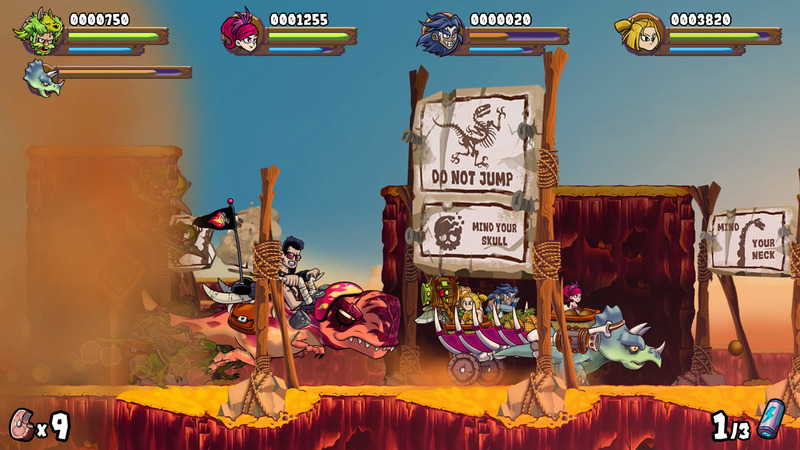 Each character has his/her own special attack and ability such as Liliana throwing her spear into the side of a cliff to use as a step when trying climb, or Moe’s two-headed monkey that leaps from his drum to distract enemies, and each is needed to navigate Caveman Warriors’s colorful landscape. Somehow JanduSoft accomplishes making these four characters endearing even without dialogue. Their design, grunts, laughs and special moves are all that is needed to understand their personalities and playing as any one of them is a joy. Enemies are designed quite well also. They range from chubby bald cavemen that run at you once they detect you to plants that fire off thorns and many surprising ones that I don’t want to spoil. Each enemy must be dealt with cautiously. The way you can plan out how to best clear the screen of enemies adds a nice feeling of depth to a genre you might not expect this from. The drops enemies release upon death are varied as well, sometimes dropping food like donuts, hamburgers, and lollipops or amusing little items like a stone age GameBoy and even a red cap similar to Mario’s. As much as I liked the minor enemies you come across, the bosses at the end of each level really take the cave-cake and learning how to defeat them throughout the encounter is both challenging and very intuitive. This brings me to the overall difficulty of Caveman Warriors. By no means is this an easy game and do not expect to beat it with any half-hearted attempt. This isn’t to say it’s extremely hard, just that you’ll need to pay attention, plan your way forward and if playing multiplayer, communication will be key. All that said, I found the difficulty very well balanced that seemed to increase evenly across the levels. Even when your caveman bites the dust it’s easy to understand why or recognize you may have been rushing something that needs to be approached with more care. Never was a challenging section made to feel daunting, rather it made you feel like you wanted to play until you got past it. 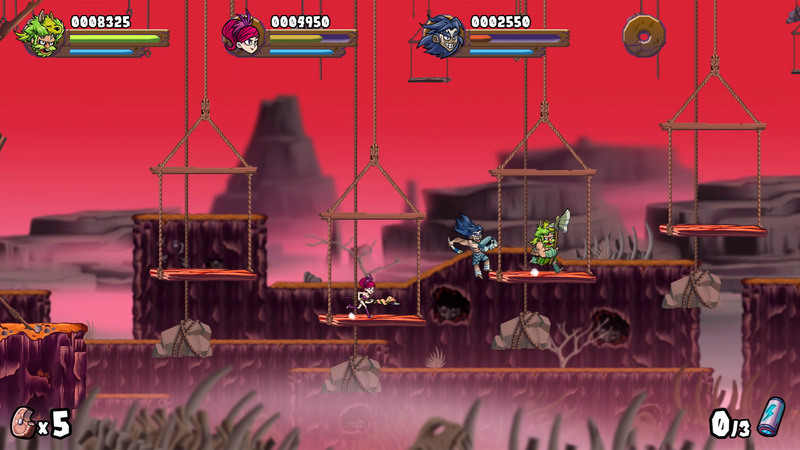 Something else Caveman Warriors gets right is the music and overall sound of the game. 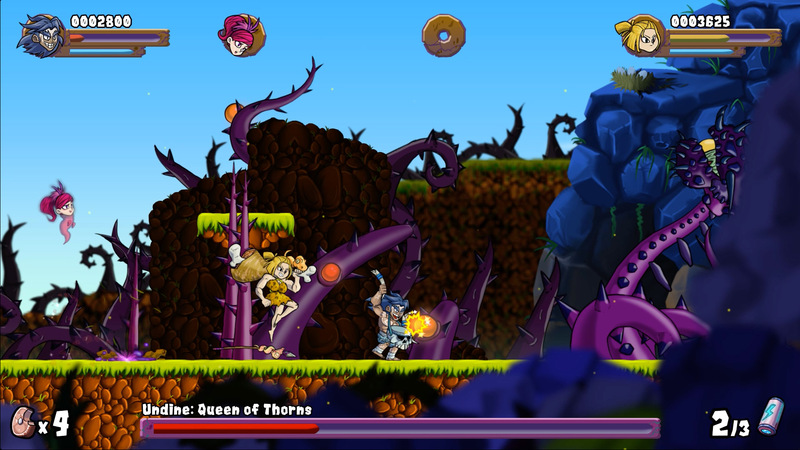 The music is just as “colorful” as the game and its prehistoric beats match each level perfectly. 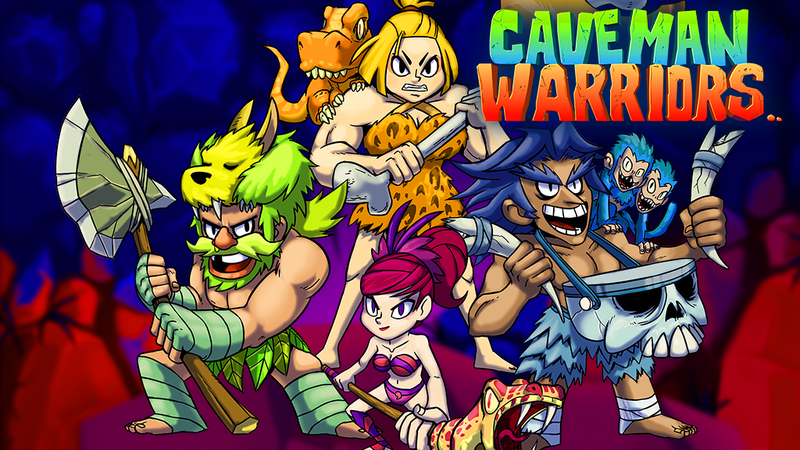 From the grunts of the cavemen, screeches of the pterodactyls and the otherworldly music that plays when the aliens are around, Cavemen Warriors knows what kind of game it is and the sound matches perfectly. There’s a lot of personality to Cavemen Warriors and at least half of that can be attributed to the music. Aside from a very minor issue I have with button layout, the only thing I can say that I didn’t like about Caveman Warriors was playing single-player. Caveman Warriors definitely feels better when tackling it with at least a second player sharing the accomplishment and working together to rescue those little cave kids. 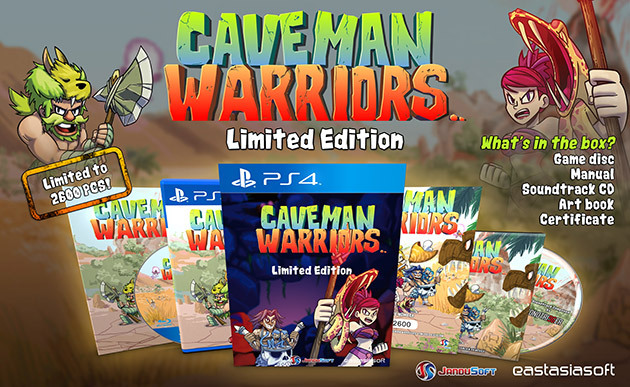 Unfortunately, Cavemen Warriors is local co-op only and while it’s great to have a game that actually lets you play with friends on your own couch, the option to play online would have been nice too. 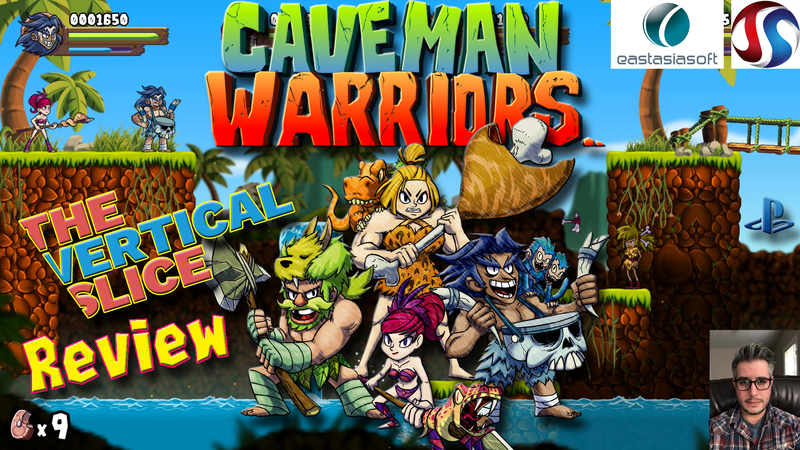 Overall though, Caveman Warriors is an extremely well balanced, colorful, and most importantly, fun game with charming characters and a beautiful world and I’ll most likely replay it with friends a few times over. JanduSoft has created a truly fun experience and I’ll definitely be keeping my eye out for future releases from them. 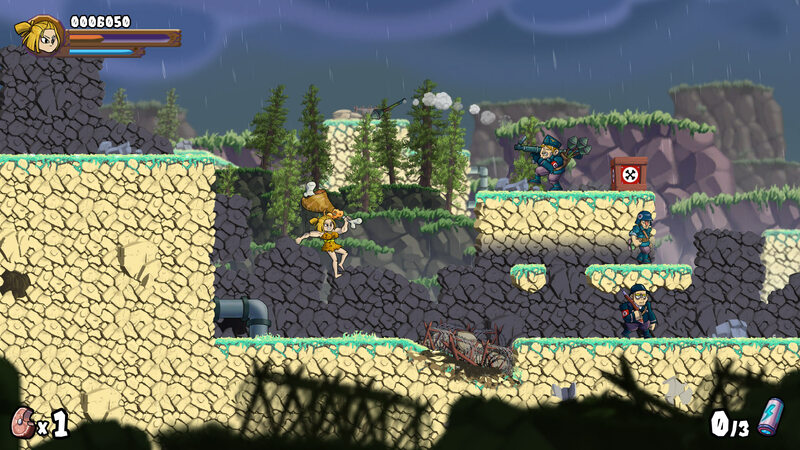 Caveman Warriors is available now on PlayStation 4 and Xbox One for $14.99. The game is also available on various other platforms/mobile devices. A copy of the game was generously provided by our friends at eastasiasoft/JanduSoft.